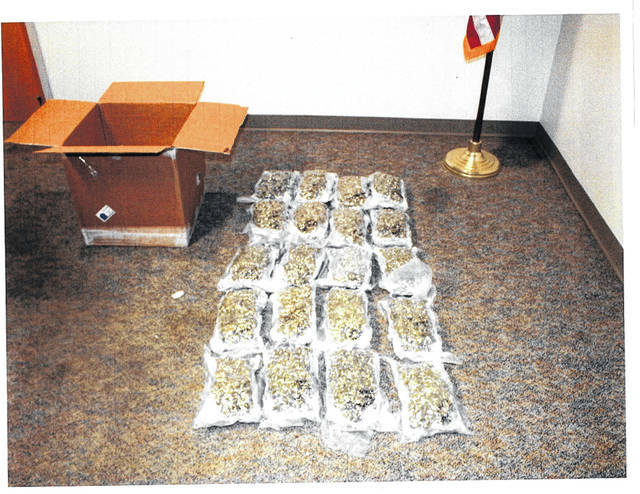 Shown are 20 bags of marijuana that authorities believe were shipped from Nevada to a residence in Highland County. A Hillsboro woman is facing criminal charges after police say she had 20 pounds of marijuana shipped to her this week through the United States Postal Service. Highland County Sheriff Donnie Barrera said in a news release that Alyssa Bellow, 20, admitted to having a package shipped to her containing roughly $100,000 worth of marijuana. Barrera told The Times-Gazette that investigators believe the package came from Nevada. Barrera said the USPS contacted the sheriff’s office on Tuesday reporting a suspicious package scheduled for delivery in Highland County. Barrera, Highland County sheriff’s detectives, the office’s K-9 unit and officers from the Hillsboro Police Department responded to the Hillsboro Post Office, and the K-9 “indicated on one particular package,” according to the sheriff. Sheriff’s detectives and deputies, along with detectives with the U.S. Pipeline 23 Task Force, set the package out at its destination residence for pickup, Barrera said. The package was not picked up on Tuesday, so officers placed it at the residence again on Wednesday. At that time, officers observed two females pick it up, Barrera said. Deputies then conducted a traffic stop on the vehicle, finding the two women, along with three children, in the vehicle, according to Barrera. The package was in the trunk, he said. All the occupants were transported to the sheriff’s office, and Highland County Children Services was notified, Barrera said. Deputies determined the package was intended for Bellow, who was later located and interviewed, according to Barrera. Bellow admitted her involvement and gave deputies permission to open the package, Barrera said. “The package was found to contain 20 pounds of marijuana, with an estimated street value of over $100,000,” the sheriff said. Evidence in the case will be submitted to the Bureau of Criminal Investigation in London, Ohio, for analysis, Barrera said. Authorities are waiting on the results of the tests to make an arrest, he said. When asked if the two other women in the case will be charged, Barrera declined to comment due to the pending investigation.